Offset broke his silence to explain why he crashed his wife Cardi B's Rolling Loud Festival performance after which fans slammed him saying it was a publicity stunt. The Migos, 27, rapper took to Twitter on Sunday, December 16, to speak out about the incident. He wrote, "All of my wrongs have been made public, I figure It’s only right that my apologies are made public too", adding, "A n—a was just trying …..thank god I ain’t got no balloons sheeesh." As previously reported, on Saturday, December, 15, the rapper walked onto the stage during the songstress set in Los Angeles, with a bunch of flowers as stagehands rolled out a massive Venus Et Fleur floral display, spelling out the words "TAKE ME BACK CARDI". 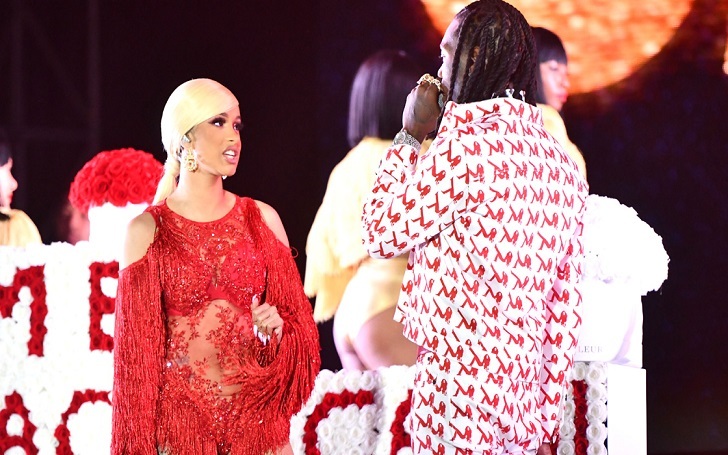 The arrangement, which featured 2,000 of Cardi’s favorite roses, reportedly was worth over $15,000. Taking a microphone, Offset told Cardi "I’m sorry" and "I love you" as the audience buzzed, cheered and jeered. As we previously reported, on December 4, the Invasion of Privacy rapper took to Instagram and announced her split with Offset, who she secretly married in September 2017. Two weeks after the breakup announcement, shared an Instagram video and publicly apologized to Cardi B and the estranged couple's 5-month-old daughter, Kulture, denying of cheating on her.